It wasn't rockets or artillery that came through the skies one week during the war. It was the horrific force of nature that suddenly put both sides in awe. As an unofficial truce began, questions and emotions battled inside every air crewman's mind as they faced masses of Vietnamese civilians outside their protective base perimeters for the first time. Could we trust them not to shoot? Could they trust us not to drop them off in a detention camp? Truces never last, but life changes a bit for all the people involved while they are happening. Sometimes wars are suspended and fighting stops for a while. A holiday that both sides recognize might do it, as happened in the Christmas truce during World War I. Weather might do it, too, as it did in Vietnam in October 1970. The "typhoon truce" was just as real, and the war stopped for three days in northern I Corps--that area bordering the demilitarized zone separating South Vietnam from the North. 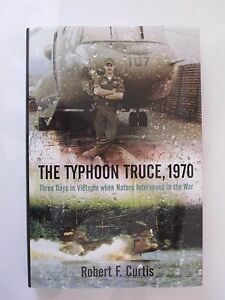 The unofficial "typhoon truce" came because first, Super Typhoon Joan arrived, devastating all the coastal lowlands in I Corps and further up into North Vietnam. Then, less than a week later came Super Typhoon Kate. Kate hit the same area with renewed fury, leaving the entire countryside under water and the people there faced with both war and natural disaster at the same time. No one but the Americans, the foreign warriors fighting throughout the country, had the resources to help the people who lived in the lowlands, and so they did. For the men who took their helicopters out into the unending rain it really made little difference. Perhaps no one would shoot at them for a while, but the everyday dangers they faced remained, magnified by the low clouds and poor visibility. The crews got just as tired, maybe more so, than on normal missions. None of that really mattered. The aircrews of the 101st Airborne went out to help anyway, because rescuing people was now their mission. In this book we see how for a brief period during an otherwise vicious war, saving life took precedence over bloody conflict. Curtis--the author of Surprised at Being Alive: An Accidental Helicopter Pilot in Vietnam and Beyond--has a unique way of moving sideways as well as forward in telling his story. Many times he interrupts the action to fill in personal details of the men involved to bring a greater depth of understanding. I believe this story will stimulate much conversation among former Vietnam War helicopter pilots and crews. I would be surprised if it did not elicit similar examples of kindness from other veterans in the midst of a devastating war. Reading this book is a mission strongly recommended. great job detailing the day to day operations, the command structure and the personalities of C/159th, complete with their triumphs and tragedies. You will have a hard time putting this one down.